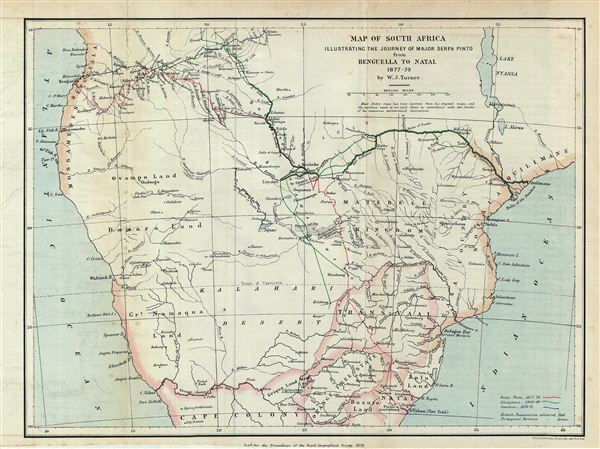 Map of South Africa Illustrating the Journey of Major Serpa Pinto from Benguella to Natal 1877-79. This is an uncommon 1879 map of central Africa by A. K. Johnston. Illustrating the journey of the Portuguese explorer Major Serpa Pinto, this map covers from the Atlantic Ocean to the Indian Ocean and from Njambi to Cape Colony. It includes the modern day African nations of Mozambique, Zimbabwe, Botswana, and Namibia. The routes traversed by Serpa Pinto (Benguella to Natal from 1877 to 1879), David Livingstone, (Zambezi River, 1849 to 1860) and Verney Lovatt Cameron (Zambezi River, 1873 to 1875) are identified with color coding. The mission town of Livingstonia (Kondowe), named after the missionary David Livingstone, is noted at the southern tip of Lake Nyassa or Lake Malawi. British colonies are highlighted in red and Portuguese colonies in brown. Victoria Falls (along with its indigenous name, Mosi-oa-Tunya), the Ruins of Zumbo, and the Kalahari Desert are all identified. Alexandre de Serpa Pinto recorded his travels across Africa in a book entitled 'How I crossed Africa.' He was later appointed governor of Mozambique in 1889. This map was drawn by A. K. Johnston and published by e. Stanford with contributions from W. J. Turner, for issue in the 1879 Proceedings of the Royal Geographical Society and Monthly Record of Geography. Stanford, E. Proceedings of the Royal Geographical Society and Monthly Record of Geography, Vol. 1, 1879. Very good. Minor wear and toning on original fold lines. Bassett, T., and Scheven, Y., Maps of Africa to 1900 : a checklist of maps in atlases and geographical journals in the collections of the University of Illinois, Urbana-Champaign, 910.6RLn.s./rbx.